We have known for quite some time about Rupert Murdoch’s plans to launch an iPad-only newspaper. The launch has been delayed multiple times. The delays have been blamed on Steve Jobs’ health issues, unexpected complications, and some last minute modifications. 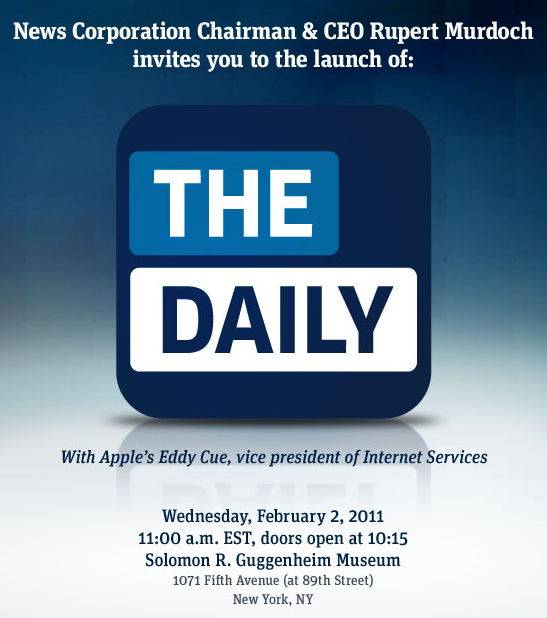 News Corp. has already sent out invitations for the launch of The Daily to the media. It will be presented at a special event in New York on February 2nd, 2011. As expected, Steve Jobs won’t� be part of the presentation as he battles with health issues. The launch of The Daily is very significant as it could lead to more magazine and newspaper subscription models for iPad and other tablets. The Daily is expected to cost $0.99 cents a week and will be available on Apple iPad for now. As more people adopt Apple iPad and with iPad 2 just around the corner, the success of The Daily could give other publishers a good idea whether Apple iPad and similar tablets can save their businesses. In the past few weeks, we have heard about the imminent release of white iPhone 4. The device was expected to be released a few months ago. But Apple seems to have had multiple issues getting white iPhones to work without any hitches. In a conversion with Engadget’s Joshua Topolsky, Steve Wozniak confirmed that Apple has had trouble with white iPhone’s camera. Apparently, the white case caused light leakage when flash was used. According to Steve, it seems the white case affected the proximity sensor in iPhone as well. With white iPhone expected to make its debut very soon (at BestBuy and other stores), it seems Apple has finally figured out how to make a white iPhone without any sensor or camera issues. At this point, it is not clear how excited people are about this phone. It was expected to make it to the market in 2010. iPhone fans are probably better off waiting for white iPhone 5 at this point. Ready for iPhone 5 Rumors?